Sight Word Target Practice - I Can Teach My Child! Hi! I’m Kristina from Toddler Approved and I am so excited to be guest posting today while Jenae takes care of her pregnant self and rests! Can’t wait to meet her cute little baby girl. Today I am going to share a simple movement activity with you. My kids don’t ever seem to stop moving. I love to channel their non-stop energy and do simple and active learning games with them! My oldest son just started kindergarten and I am trying to find ways to extend his learning at home each afternoon. One of our favorite afternoon activities is a sight word target practice game using paper plates. Paper plates, markers, some sort of soft ball, and painters tape. 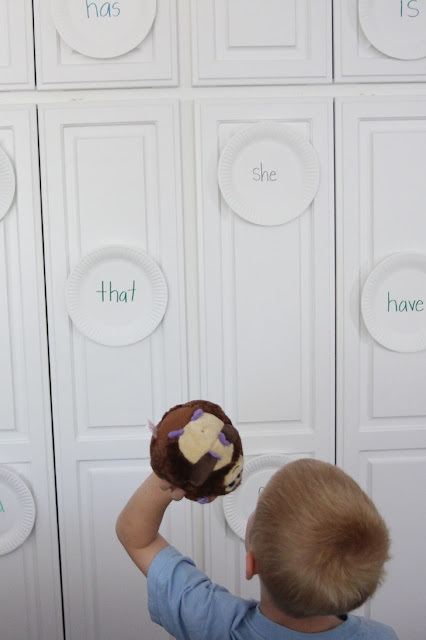 When I am reading with my son I try and notice which sight words are harder for him to remember and then I write them on paper plates and stick them on our kitchen cupboards using painters tape. We love using these stuffed Ty Beanie Ballz for throwing games because they are soft and don’t hurt if someone accidentally gets hit while we are playing. We like to play our sight word game while we are reading and also just for fun throughout the afternoon/evening. After our cupboards are covered with a few paper plate sight words, I call out a word and my son tries to find the word, read it, and then hit it with a ball. After he’s learned all of the sight words on our wall, he will yell which one he wants to hit, read it, and then throw the ball at it! When we are reading a book together we also like to stop when we find a sight word that is on our wall and go over and throw the ball at the word… and then head back over to the kitchen table to keep reading. My daughter always likes to get in on the fun too, so we give her a ball and she tries to hit paper plate words that start with a specific alphabet letter. We have also played this game using the materials from our paper plate name game (featured over at NurtureStore). My preschooler practiced saying the letters on the paper plates and throwing a ball at the different letters in her name. This is activity is great for building hand-eye coordination and for practicing simple throwing skills. 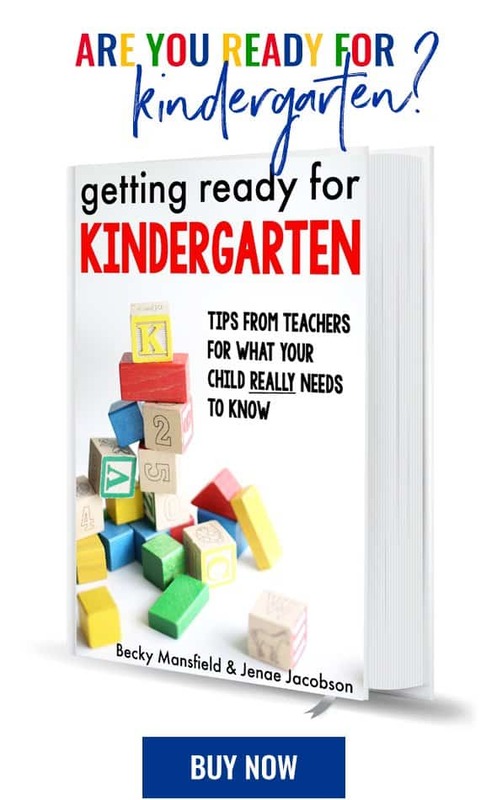 You could also adapt it in a variety of ways depending on which learning skill you are working on (word family words, alphabet letters, numbers, shapes, etc.). If you are a fan of movement activities that teach simple skills, make sure to check out the posts from our Move and Learn series that we are participating in with The Pleasantest Thing, Hands On: As We Grow, and Coffee Cups and Crayons. We even have a Move and Learn pinterest board filled with cool ideas. Do you have a favorite move and learn activity you can share with us? Kristina is the author of Toddler Approved, a blog where she helps parents capitalize on teachable moments in everyday life and motivates them to discover, create, and learn with their children. She is a mom of three and is a former Special Education teacher and Curriculum Specialist. When she’s not blogging, you’ll find Kristina jogging around town, organizing church and neighborhood social events, throwing crafting parties for kids, and traveling with her family. She also hosts a monthly Virtual Book Club for Kids online and a Mommy & Me Book Club with friends offline. Kristina tweets as @ToddlerApproved and can be found on Facebook and Pinterest. Thanks again Jenae for letting me come share a post with your readers! 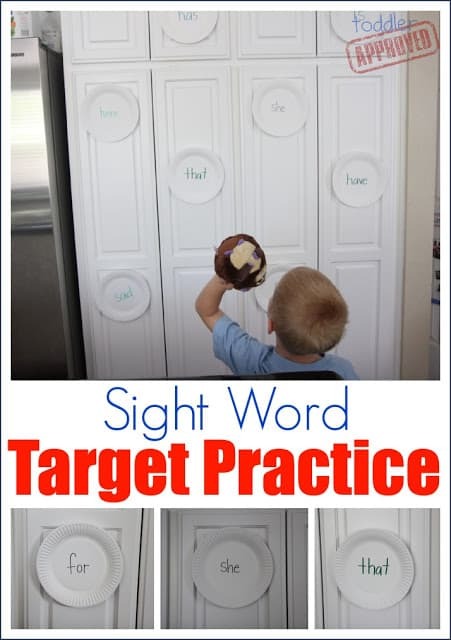 What a fun way to get the kids to practice, both their aim and their words! Thanks for the tip. We just got our first list of sight words- can’t wait to try this! Love this! 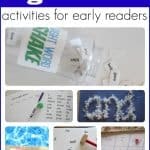 I’m always looking for creative ways to get my kids working on their literacy skills, and this fits the bill. Pinned! What a great idea! 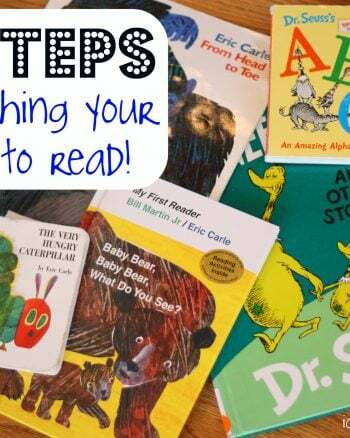 My toddler is just learning how to read, and I’m sure he will have fun learning this way. Pinning right now. What a beautiful idea. Thank you for sharing this. Will try it on my boy. You can also let the little ones swat the word with a fly swatter! They would love that. Hi! I absolutely love this idea. 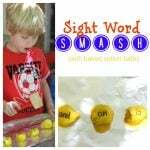 I have featured it in my post <ahref="http://www.lifeloveandlasagna.com/practicing-sight-words-with-your-creative-kindergartener/&quot; Practicing Sight Words with Your Creative Kindergartener . Please let me know if that’s not okay. Great post! Tried this one this year after seeing it at a parent workshop at my son’s school. The day after we used the plates on the wall, we used them on the floor and threw bean bags at them. The day after that we used them as frisbees. I would throw them and my son would read the words after he caught them. We also used them again on the floor by having him jump on the correct word after I showed him the flash card. We figured pretty quick that the plates would slide on the floor, so for safety we used packaging tape on the backs. I was reminded of using paper plates to “ice skate” indoors in my preschool class, perhaps another game?